Reserving tickets online is really easy. All you need is the keen sense of finding the lates deals which means you need to sign up for the deal update newsletter of your favorite airline company or you frequently check their website (which I do :P). They usually post their latest update a few hours after it was launched. I have no idea why this happens all I know is that it is proven and tested. 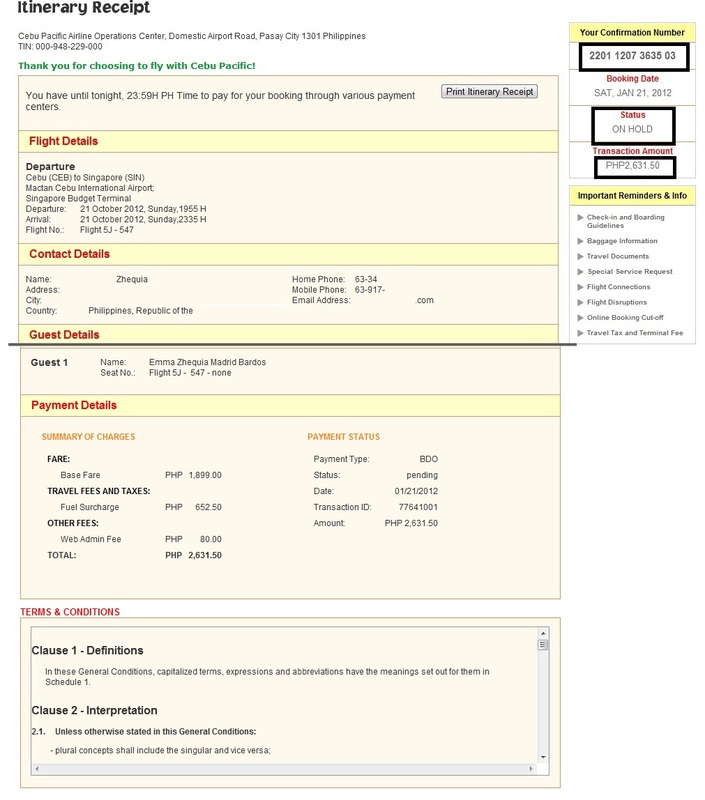 What you will need to do is check for the flights available. It does pay to read. Tip #2. Check for the Travel Period of the latest deal. Don't deny it, we have had this blunder before! Didn't we cuss one time when the flight we wanted does not have a promo deal? CHECK IT. Step 3: Add-ons which has the bold word: OPTIONAL meaning you can opt not to have this on top of your ticket price. This means you can uncheck the items you feel unnecessary. Again, click on Continue at the bottom of the page. Add-on Continued which is also optional, this is the Seat Selection Page. You can choose your seat from this page. All you need to do is to scroll down on the photo of the airplane and find the yellow box, this is your assigned seat, click on the box and you will get a pop-up with your name on it, the flight route and the option to Remove Seat & Choose Seat. I always opt to remove it. It's less a Php100 off the total price of the flight, mind you. Then check the small box at the bottom of the page. Continue. Step 4 Payment Page. We're almost done with the reservation! Now here is one of the wrong assumptions with most people. You can book tickets even WITHOUT a CREDIT CARD! Yes, you have three payment options. 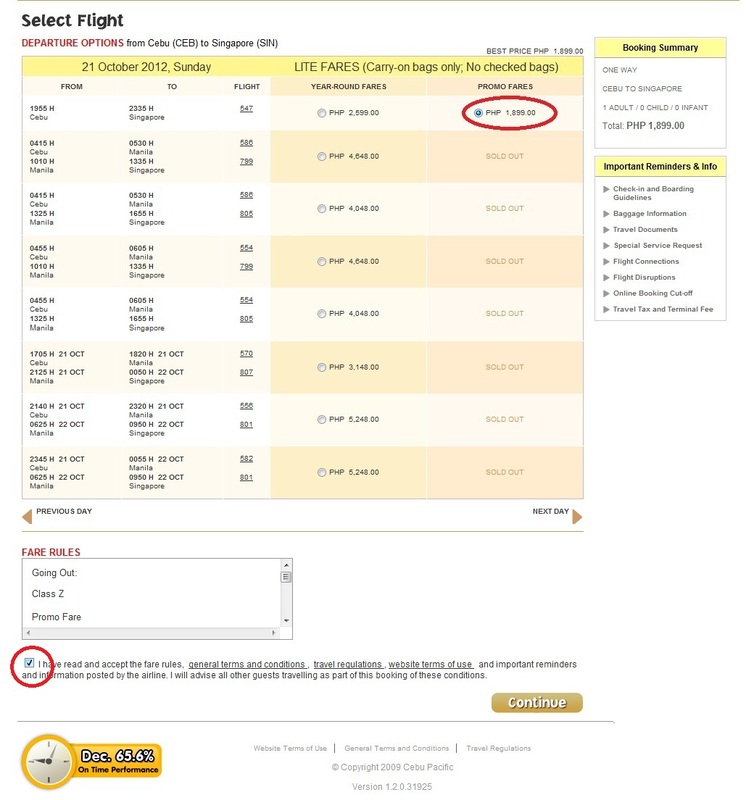 Payment Option: Credit Card - This is the default option once you reach this page. 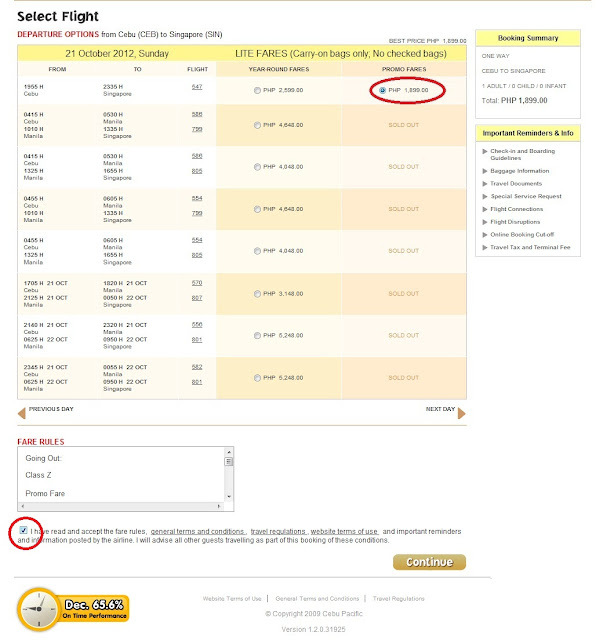 Click on the small box, this indicates that the booking summay is correct and you are now willing to proceed with the payment process. 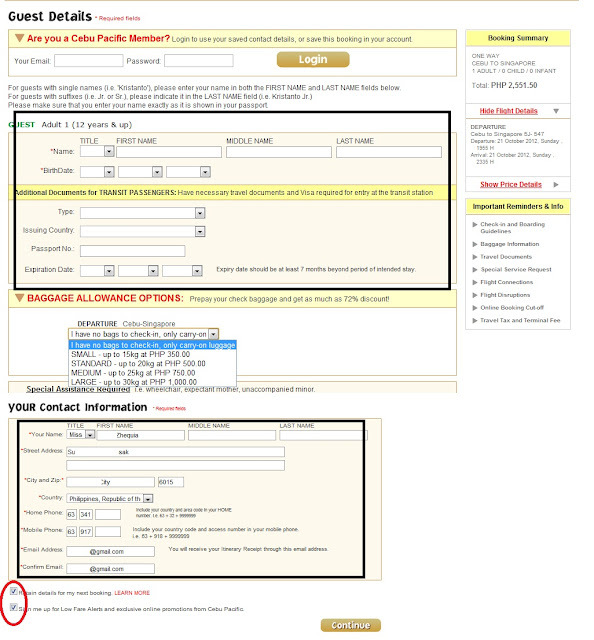 Should you have a credit card then all you need is to fill out the fields and click Continue. Payment Option: Bancnet Online This option is for online banking. Payment Option: Payment Centers This is the best option to go for non-credit card holders. You can pay your flight to any of the following banks and establishments. BDO, LB, Robinson's Savings Bank, Metrobank, Robinsons Department Store. Click on Yes that way you will recieve a confirmation to your phone and click on Continue. I choose this option when I reserve my tickets. YOU HAVE UNTIL 23:59 OF THE SAME DAY TO PAY THE TICKETS. Confirmation codes from this step is unique to any of the Payment Center, make sure to note this down. This is important in paying the tickets. Once you are done and when you click on Continue you will then get to the Final Step. Step 5. Itinerary Receipt. 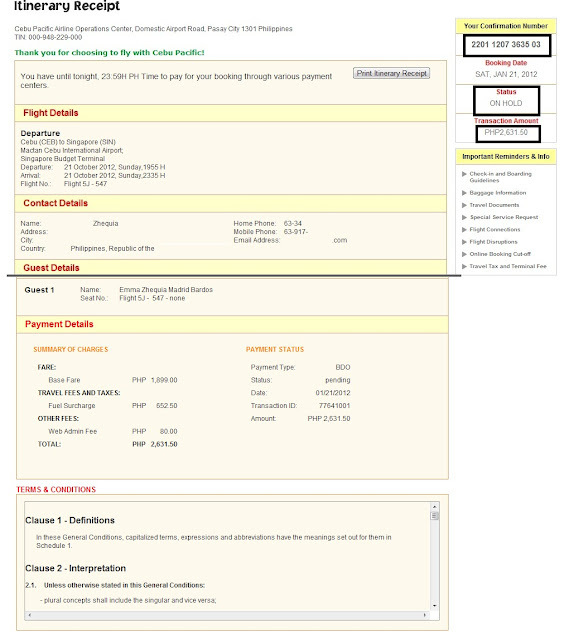 This page will show you the summary of the ticket you booked for. Note the Confirmation number and the Total Amount. maghimo pa unsaon pagbayad sa BDO? is the travel insurance neccessary? kung magpa book ko ug hotel pero wala credit card cash lang.. unsa-on man? Hi. After payment, paano makukuha yung plane ticket? Need bang pumunta sa Cebu Pacific office centers or dun na mismo sa day ng flight? 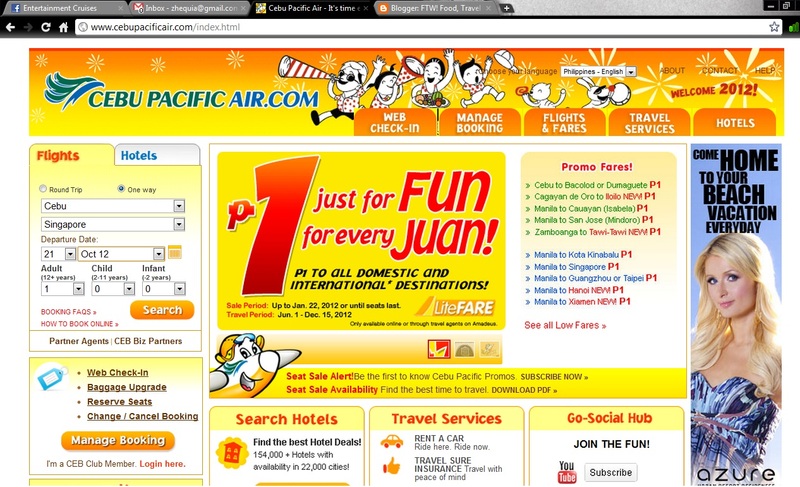 Once you pay, you can check your online account on Cebu Pacific's site and see if your reservation is now on a CONFIRMED status. You can print a copy of the itinerary and bring this with you once you board in along with your valid photo ID. Glad I was able to. Hi just wondering .. can i book a reservation ticket to avail the promo while my passport is still on process? Hi Sharjah, I believe your passport details will be asked if you are planning to book for an International flight. If you are booking for a domestic flight, it would be better as you will no longer be asked for any Passport information.